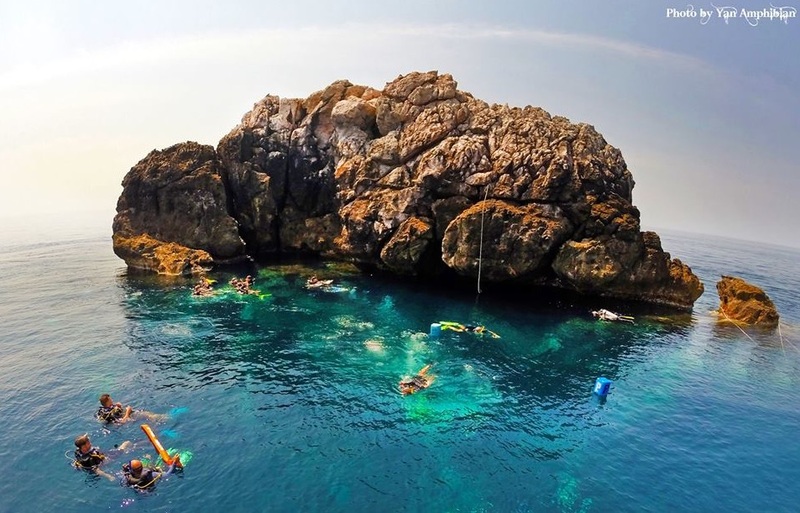 Voted the best dive site in the Gulf of Thailand, this solid granite rock is like a magnet to many kinds of tropical fish, including the awesome whale shark. It is also covered with amazing anemones and several types of corals and colorful sponges, so much to see at all depths. Enjoy a relaxing day out at Sail Rock on a comfortable cabin cruiser speedboat. Situated between Koh Phangan and Koh Tao this pinnacle rises 15 meters above the sea level, and drops down to 30 meters below the surface. Sail Rock is one of the dive sites with the highest density of fish in our area. Marine life includes big schools of 3 different types of barracuda, trevally, snapper, bat fish, moray ells, puffer fish, butterfly fish, and so much more – including the whale shark. For divers, there is also an impressive vertical chimney with entrances at 18 metres, 12 meters and 6 meters to explore. Also, an artificial reef as a fish hatchery at 30 meters, as well as some beautiful pinnacles surrounding the main rock at various depths, and the big Secret Pinnacle off rock. At Sail Rock, you can easily do two totally different dives while always spotting new marine life. For snorkelers, it is possible to snorkel there – but we call it Adventure Snorkeling – something you can only experience here, as you are snorkelling in deeper waters with the bigger marine life. Always with a snorkel guide for safety though.